Here is a recap of NACFC 2016. Fair warning, this post is looooong. But it's chocked full of great slides, access to the plenaries and to links for further information about the newest in CF research shared at NACFC. This slide shows the demographics of the CF population in the modulator area, a breakdown by molecular theratype. There are 5% of people with CF who have two stop codon mutations. On this slide, Bennett is in the dark yellow. Ultimately, Bennett is part of 12% of those with CF who have one stop codon mutation (621+1G>T) and a non-stop codon mutation (F508del). This slide shows the historic effort being extended worldwide to make sure the CF community meets its goal for a cure for all. If you look close, you can see the sponsor's name, drug name, the drug class and the current research and development stage the drug is in. This slide shows where targeted therapy is headed next. I love this slide because it shows how much farther we still have to go. As more CF genotypes are treated with better modulators at younger ages, the health of the CF population will shift dramatically. Although with modulators we expect a smaller proportion of individuals with CF will have need for "downstream" therapies, there will still be a need for these therapies. This slide shows the anticipated changes in CF population size, health and treatments. But we know that modulators will ultimately not likely be able to provide a cure for CF for all...so the CFF is continuing to work on new options. 2.) 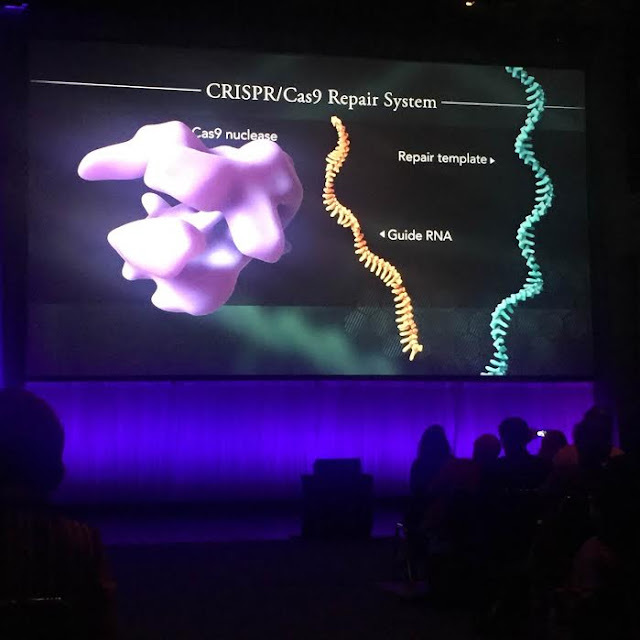 Gene-editing is bringing hope to those with CF who don't benefit from CFTR modulators. CF researchers are asking: how do we attain a therapy targeting CFTR when not all patients have the same CFTR defect? What do we do with those Class 1 and Class 5 mutations...and the 5% of patients that have both copies of the Stop Codon mutations in them? Since there is no CFTR and therefore CFTR is not getting to the surface, CFTR modulators aren't going to work. There is an new technique that is being researched that the CFF hopes will help those who don't benefit from CFTR modulators. It's called gene-editing. 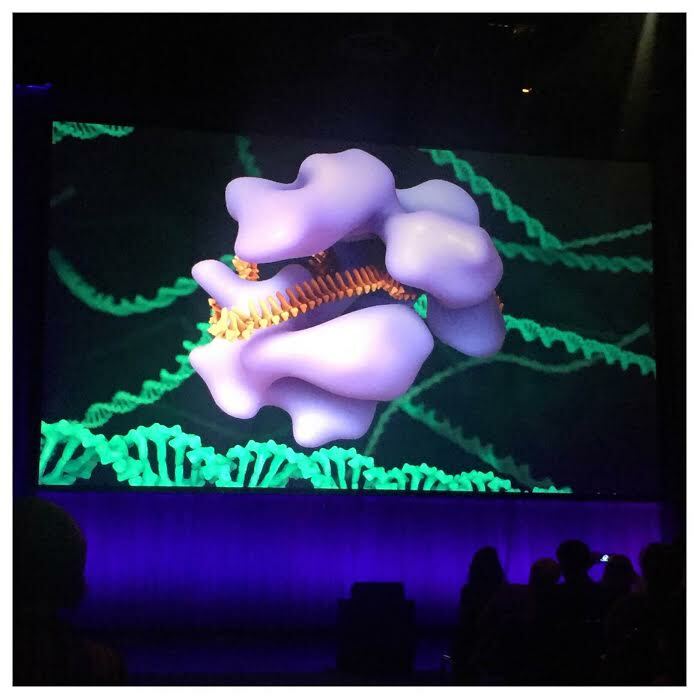 Although I can't even begin to explain gene editing, this slide is still image from a video shown at NACFC about CF and gene editing. Watch the fascinating video starting at 1:15:02 here: https://youtu.be/yaCWm8DLHo4. This slide shows the greatest challenges of gene editing today. The CFF has partnered with Editas and CRSPR Therapeutics to find a way to make this work. With gene editing is there are 190,000 base pairs. The CFF can't focus on them all. 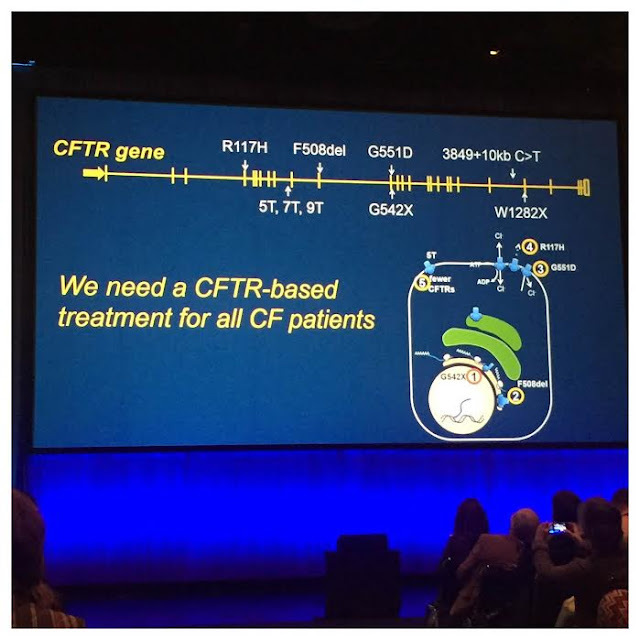 So, the CFF is focusing on those mutations that do not currently look to benefit from CFTR modulators. Beyond gene-editing, another technique being researched is manipulating the RNA to address X-mutations (stop codon mutations). Here are specific programs working on the premature truncation and X mutations that affect the 5% of people with CF who do not benefit from modulators. 3.) There are 10,000 more CF adults now than there were in 1986. The demographics are changing in CF. More adults are college graduates, students/employed and married or living together than ever before. In 30 years, median predicted survival has seen a 12 year improvement. Although this slide does not show it, the median age of death was in the 3rd decade of death in the 1980's but we've seen only a 5 year improvement in that area over the last 30 years. However, it's worth noting that all of this data reflects the era before modulators (before Kalydeco and Orkambi). Everyone expects this data to only get better in the coming years. This is a new metric that is going to appear in the Patient Registry Report this year is "life expectancy by age." This graph shows that if you've achieved a certain age (represented by the yellow), what are your calculated additional years of life expected (represented by the white). But, again, this data is pre-modulators. It is expected that those on Kalydeco and Orkambi would see even higher numbers. 4.) CFTR genotypes (genetics) affect phenotypes (symptoms) but how much depends on the factor being considered. There is a growing understanding of mutations and how they affect the disease. But, it turns out, it's very complicated. There tends to be three areas of factors that impact CF: CFTR genotype, genetic modifiers (other genes besides CFTR) and environmental factors/random events. Pancreatic sufficiency is almost completely dependent on CFTR genotype while intestinal obstruction risk and age/onset of diabetes is almost completely dependent on genetic modifiers. Studies show environmental care/random factors can have some impact on airway obstruction, body mass index and pseudomonas aeruginosa infections. It would be very nice if we could determine survival based on known genetic defect. But this slide reminds us that that is not possible considering the myriad of factors that go in to determining one's health. 5.) Early life nutrition has significant impact on pulmonary system. This left side of the slide shows that when examined in pre-2001 data, children with the lowest lung function also had the lowest weight-for-age. Even if you adjust for signs of lung disease, this data didn't change, in fact, it got stronger. It turns out, what determine's one having more lung decline is having small lungs. Recently, similar data (on the right side) was evaluated to see if this data had changed. Clearly, it has not. Conversely, data also shows that if you improve your nutritional status, your lung function goes up dramatically. As Wayne Morgan, MD said when he shared these slides: "a child's job is to build big lungs, healthy lungs. If you are not growing well, if you are nutritionally behind, your body is sacrificing lung growth to presumably grow the brain, it does hurt the lung." 6.) Sicker patients receive more treatments. But that needs to change. This slide shows that, on average, at 3 months, 75% of CF patients have gotten back to their baseline lung function after an exacerbation. At 6 months, 81% of CFpatients have gotten back to their baseline. At the end of a year, 85% of people with CF have been able to get back to their normal lung function. However, pulmonary exacerbations can have long-term implications as 15% of patients fail to recover 90% of their baseline FEV1 within a year. That's 1 in every 7 people with CF don't recover their baseline. That can be 4-5 years of decline related to one event. Dr. Morgan explained we have a lot more to learn in this area - how to prevent them and treat them. There are several studies going on right now learning more, including understanding exacerbations in children. The interesting thing is having an exacerbation predicts an exacerbation. Compared to those who have never a exacerbation and lose just 1% of lung function per year, those who have had an exacerbation lose 1.8% of lung function per year . "If you are having an exacerbation, you are likely to have more...as though the disease becomes accelerated. Exacerbations eat away at lung function," says Dr. Morgan. This slide shows a 2013 analysis of those who had low lung function, about 50% of them received IV treatment (with a high percentage receiving oral treatment) for, on average, 20% of lung function loss. But this data shows that the healthier patients, the patients with the higher baseline lung function, the less likely they were to be treated. Dr. Morgan explains, "so, if you compare the highest deciles, the highest lung function patients to the lowest, the odds of the healthiest being treated, the odds ration is .15, almost nonexistent. And that's completely illogical. Because if you have 100% lung function, and you lost 20% of it, then you've lost a lot more lung function than someone who is 50% and lost 20%. And also, in a disease that we know accelerates, where exacerbations predict exacerbations, we could be missing a chance to stop that if we are not treating healthy patients...we appear not to be treating people as aggressively as we should." While more patients are being treated today than ten years ago, the same trend is evident. 7.) Efficiency of treatment (clinical trials) does not equal effectiveness (real world). It's important to know that just because a medication looks like it works really well in a trial, it may not work as well in the real world for every patient. Some reasons this is possible include the fact that trials often exclude the sickest patients who benefit, patients are often given more careful followup while in the trial, there is more standardization of management in a trial and patients in trials are often more adherent to their treatments than those who are not in trials. 8.) People with CF and their families can now drive the research agenda (more on this to come in a follow up blog post). Although the patient registry has been around for decades, for the first time ever, the CFF is looking for people with CF and their families to give feedback on what *they* want to know more about with regard to cystic fibrosis. * Do people with CF in different regions of the US have different infection rates and health outcomes? * Do all people with CF eligible for transplant get a referral? If not, are those not referred different from those who are referred? I am personally co-leading this initiative with a great co-leader, David, and a fantastic team of people with CF and parents of kids with CF, who are working alongside the CF Foundation to develop better ways to help people with CF and their families engage in CF research. The InsightCF Registry Research Project is different than clinical trials because it uses observational research collected through the patient registry of almost every person with CF who is seen at a CF Care Center within the US. I look forward to hearing what people with CF and their families want to know more about and how the Patient Registry can help answer our questions! "A team of researchers investigated which factors are associated, from an early stage, to airway alterations in patients with CF... [study] results suggest that airway dehydration is an important therapeutic target in young children with CF." "Research is currently ongoing to evaluate which of the rarer mutations can be targeted with combinations of CFTR potentiators and correctors."